The photograph shows the jacks after voicing and before the dampers have been cut and put in position. The jack on the left-hand side is partly raised and is in the process of plucking the string. In order to make the quills last as long as possible the quill is cut away underneath so that there is no point of sharp curvature when the quill plucks the strings. At the same time the overall stiffness of the quill is regulated so that the amount the string is lifted gives the string the same amount of energy as the nearby notes and, indeed, the notes throughout the rest of the compass. Producing an even gradual curve in the plectrum ensures that no section of the quill becomes work hardened and breaks. This is done by making the quill slightly wedge-shaped when seen from above and, more importantly, by thinning it towards its outer end from underneath. In theory, therefore, a quill which is only slightly curved throughout its entire length should last forever. In fact a number of instruments has survived to the present day still with their original quills. Getting the balance between making the quill curve evenly over its entire length and at the same time produce the same amount of sound as in the neighbouring strings and throughout the rest of the compass is a difficult balance to achieve and requires a certain amount of skill and experience. 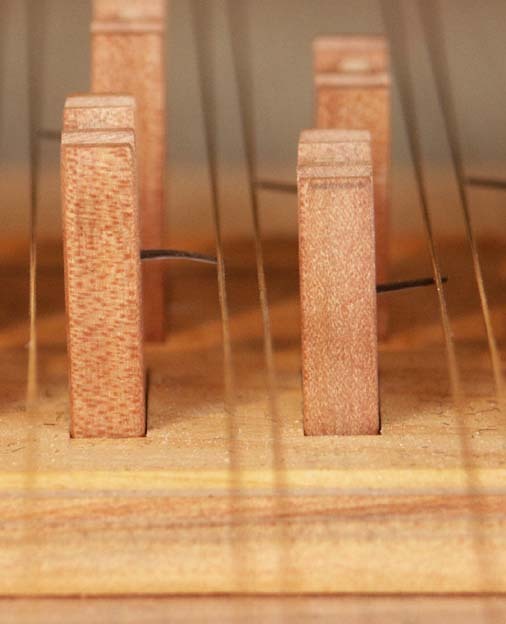 A number of harpsichord supply houses sell sets of plastic quills of graduated thicknesses with the intention of using the thinner quills in the treble and the thicker ones in the bass. However a quill of constant thickness does not produce an even and regular curve along its length - this is possible only by gradually reducing the thickness of the quill towards its outer end. Quills of constant thickness bend strongly near the face of the tongue and, because of they become work-hardened at that point, they become brittle and eventually break. It is a myth that natural quill breaks more readily than plastic plectra. Genuine raven plectra are easier to voice and last indefinitely if voiced correctly. Achieving a balanced sound across the compass of an instrument, by using the outer end of the feathers in the treble and the root end of the feather in the bass, is if anything easier with natural quill than with any of the modern plastic substitutes. The problem is supply and the ecological protection of raven as a species. There are, however, a number of places in the world where ravens are considered and are, in fact, a real pest and where they are not protected. One solution to this problem is that ravens moult their feathers naturally in spring. A visit to a rubbish tip in spring near a raven's nesting site can provide a supply of the strong wing flight feathers that is sufficient for most harpsichord builders. It is not, however, normally sufficient for commercial exploitation. But please don't ask me where I get my meagre supply of raven feathers!! - but for a hint see the front page of this section.